As scattered protests erupted elsewhere in Washington, Trump raised his right hand and put his left on a Bible used by Abraham Lincoln and repeated a 35-word oath of office from the U.S. Constitution, with U.S. Chief Justice John Roberts presiding. At Trump’s side was his wife, Melania Trump. 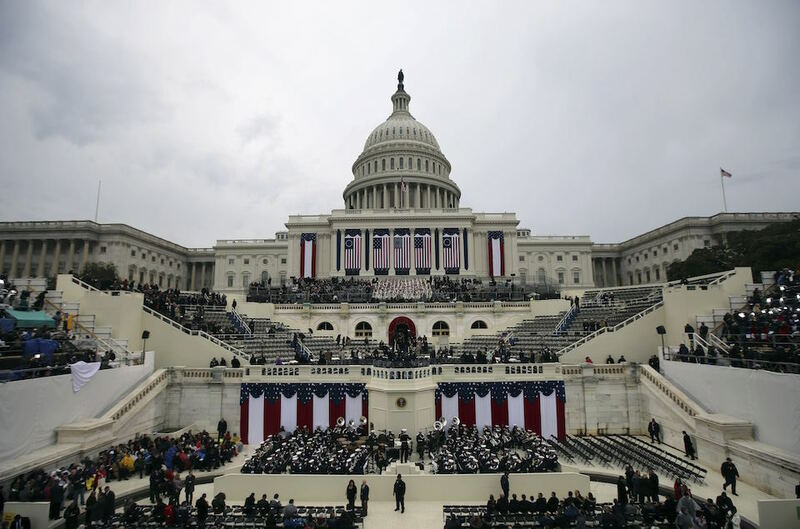 The transition from a Democratic president to a Republican took place on the West Front of the domed U.S. Capitol before a crowd of former presidents, dignitaries and hundreds of thousands of people on the grounds of the National Mall. The crowd stretched westward on a cool day of occasional light rain. The new president was to deliver an inaugural address lasting about 20 minutes centred on the campaign themes that he used in his improbable November election victory over Democrat Hillary Clinton. Clinton attended the ceremony with her husband, former President Bill Clinton. “It will be optimistic. It will be visionary, but it’s going to be philosophical,” his spokesman, Sean Spicer, said of the speech, speaking to NBC on Friday morning. Trump, 70, takes over a country divided after a bitter election campaign. A wealthy New York businessman and former reality TV star, he will set the country on a new, uncertain path at home and abroad. 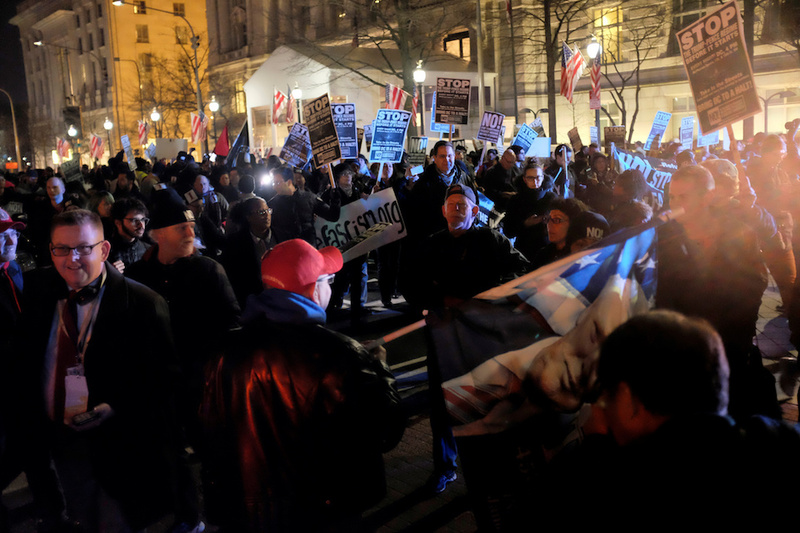 Away from the Capitol, masked activists ran through the streets smashing windows with hammers at a McDonald’s restaurant, a Starbucks coffee shop and Bobby Van’s Grill steakhouse several blocks from the White House. They carried black anarchist flags and signs that said, “Join the resistance, fight back now.” Police used pepper spray and chased them down a major avenue, a Reuters eyewitness reported. In another location not far from the White House, protesters also scuffled with police, at one point throwing aluminium chairs at them at outdoor café. At the inaugural ceremony, former presidents George W. Bush and Jimmy Carter were also present with their wives. Bush’s father, former President George H.W. Bush, 92, was in Houston recovering from pneumonia. Trump and his vice president, Mike Pence, began the day attending a prayer service at St. John’s Episcopal Church near the White House. Trump, wearing a dark suit and red tie, and Melania Trump, clad in a classic-styled, powder blue ensemble, then headed into the White House for a meeting with Obama and his wife, Michelle. Trump takes office with work to do to bolster his image. An ABC News/Washington Post poll this week found only 40 percent of Americans viewed Trump favourably, the lowest rating for an incoming president since Democrat Carter in 1977, and the same percentage approved of how he has handled the transition. 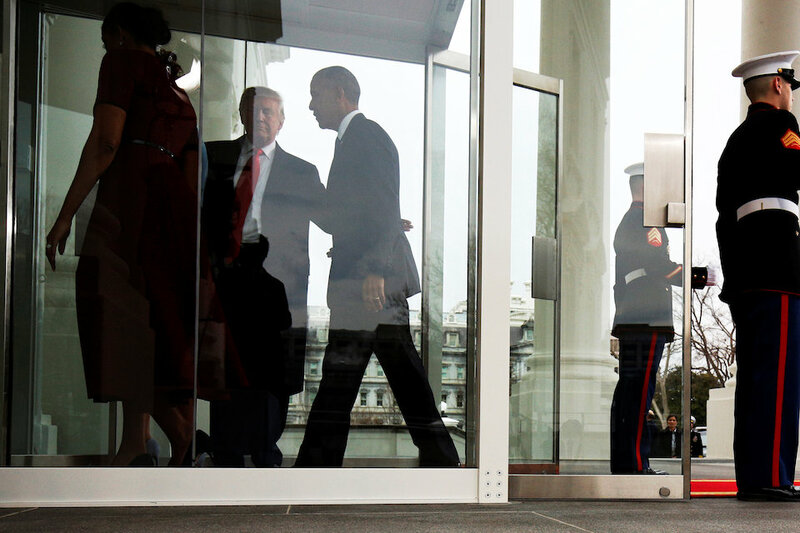 His ascension to the White House, while welcomed by Republicans tired of Obama’s eight years in office, raises a host of questions for the United States. Trump campaigned on a pledge to take the country on a more isolationist, protectionist path and has vowed to impose a 35 percent tariff on goods on imports from U.S. companies that went abroad. His desire for warmer ties with Russian President Vladimir Putin and threats to cut funding for North Atlantic Treaty Organization nations has allies from Britain to the Baltics worried that the traditional U.S. security umbrella will be diminished. In the Middle East, Trump has said he wants to move the U.S. embassy in Israel from Tel Aviv to Jerusalem, at the risk of angering Arabs and stirring international concern. He has yet to sketch out how he plans to carry out a campaign pledge to “knock the hell out of” Islamic State militants. The inaugural festivities may have a more partisan edge than usual, given Trump’s scorching campaign and continuing confrontations between him and Democrats over his take-no-prisoners Twitter attacks and pledge to roll back many of Obama’s policies. More than 60 Democratic lawmakers plan to stay away from the proceedings to protest Trump, spurred on after he derided U.S. Representative John Lewis of Georgia, a hero of the civil rights movement, for calling him an illegitimate president. Thousands of anti-Trump protesters were expected among the inauguration crowd and many demonstrators will participate in a “Women’s March on Washington” on Saturday. Protests are also planned in other cities in the United States and abroad. Keith Kidwell, chairman of the Republican Party in Beaufort County, North Carolina, was among the crowds on Friday, eager to see the start of the Trump presidency. “I cling to my guns and my Bible. I’ve been waiting a long eight years for this day,” said Kidwell, adding he initially supported U.S. Senator Ted Cruz to be the Republican presidential nominee but was now squarely behind Trump. Trump’s to-do list has given Republicans hope that, since they also control the U.S. Congress, they can quickly repeal and replace Obama’s signature healthcare law, approve sweeping tax reform and roll back many federal regulations they say are stifling the U.S. economy. Democrats, in search of firm political footing after the unexpected defeat of Hillary Clinton, are planning to fight him at every turn. They deeply oppose Trump’s anti-immigrant rhetoric from the campaign trail and plans to build a wall along the southern U.S. border with Mexico. Trump’s critics have been emboldened to attack his legitimacy because his win came in the Electoral College, which gives smaller states more clout in the outcome. He lost the popular vote to Clinton by about 2.9 million. Trump’s critics also point to the conclusion of U.S. intelligence agencies that Russia used hacking and other methods during the campaign to try to tilt the election in the Republican’s favour. Trump has acknowledged the finding – denied by Moscow – that Russia was behind the hacking but said it did not affect the outcome of the election. To his critics – including Obama who during the campaign called Trump temperamentally unfit for the White House – his straight talk can be jarring, especially when expressed in tweets. His supporters, many of them working-class whites, see Trump as a refreshingly anti-establishment figure who eschews political correctness. “He’s here for the working man” supporter Adam Coletti of Plainfield, Connecticut, said as he headed towards the inauguration.